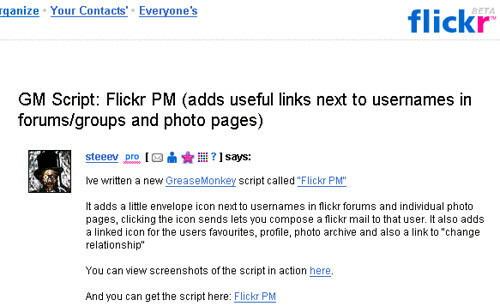 Ive written a GreaseMonkey script compatible with FireFox and Google Chrome called "Flickr PM"
individual photo pages, clicking the icon pops up a window that sends lets you compose and send a flickr mail to that user without leaving your current page. It also adds a linked icon for the users favourites, profile, photo archive, list of interesting photos, a link to Flickr Scout and Flickr Inspector and also to InterestingBy, which lists that users photos in order of Interestingness. I've added FlickrPM functionality to search pages, contact list pages, recent activity and comments you've made pages. Ive also added a link "SC" that takes you to Flickr Scout, which shows which of that users images are featured in the Explore pages and a link "FI" to Flickr Inspector which gives you detailed info and stats on that user. 15th Sep 2009 added FlickrPM functionality to Gallery pages. 16th Oct 2009 added "RE" - change relationship link , renamed text links. 18th Jun 2010 script is now also compatible with Safari, Opera and Google Chrome! 30th Jul 2013 fixed script for latest flickr changes. Donate: If you appreciate my scripts and would like to thank me for them, paypal donations are welcome, see my website for the paypal link.